A tailor is often seen as someone who fixes damaged clothes. 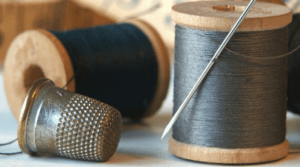 Did you know a tailor can also be a fashion designer? Each season, closets around the country are cleaned out, and old styles placed in the trash. Before you throw out your shoulder pad sweater from the 80’s, consider taking it to a tailor at your local dry cleaner for a fashion update. You don’t need to spend a fortune on new clothes. Not all dry cleaners offer tailoring services and alterations, but at Mulberrys we believe clothes shouldn’t just be clean. They should be the perfect fit to make you feel and look your best. Here are five simple ways to freshen up your look with the help of a tailor at your local Mulberrys location. 1. Reinvent the neckline. A flattering neckline can make or break an outfit. A tailor can transform the neckline of your favorite dress or shirt. Cowl necks can turn into halters. Collars can vanish from button downs. Turtlenecks can become v-necks. A tailor will help redesign a neckline to fit your personal style. 2. Button replacement. A simple button replacement can spruce up any traditional dress shirt. If you happen to lose a button, a tailor can replace it with a similar button. If you happen to get bored of the simple white buttons on your dress shirt, a tailor can replace them with colorful or patterned buttons. 3. Add an exposed zipper. A tailor can replace a broken zipper, but they can also add a zipper for a bold fashion statement. An exposed zipper is an edgy look for a simple black cocktail dress or a straight leg dress pant. 4. Lengthen a shirt hem. A curved, shirttail hem adds an extra flare to any shirt. It also helps avoid bunching when tucked into a pair of pants, giving you a clean look. Your tailor can assist in determining the perfect shirt hem for your specific style. 5. Hem jeans. Have you been wearing a pair of jeans that perfectly fit your hips but are too long? A few inches off of the bottom will make all the difference. A tailor can remove the amount of fabric needed from the bottom of your jeans and reattach your worn/distressed hem to the bottom of the new length. At Mulberrys, our tailors have over 30 years of hands-on experience and can assist with minor fixes to major alterations. Bring your clothes to any of our locations in Saint Paul, Minneapolis or San Francisco. And while you’re giving your old clothes a fresh start, consider dry cleaning them, too! Check out more ideas for old clothing.